When His Exalted Malignancy Magary I churned out his latest Funbag under the headline “Would You Rather Be Born Old Or Die Young?” I thought of baseball, and how it has become this new battleground for the end of one generation at the neglectful hands of the next. That’s the New Narrative, ladles and jellyspoons, Same As The Old Narrative. Except that, well, it really isn’t that at all. The people who run baseball were colluding against their own product by signing nobody and then in a late burst blew through a billion scoots on about six players, most of them Mike Trout and Bryce Harper. Baseball was granite-wallet cheap, then it was hyper-profligate, all at the same time. Well done, baseball. Indeed, baseball now is Mike Trout, and he is baseball, and if people want to expend life energy arguing about that, don’t be offended if you can’t be heard over the snoring. 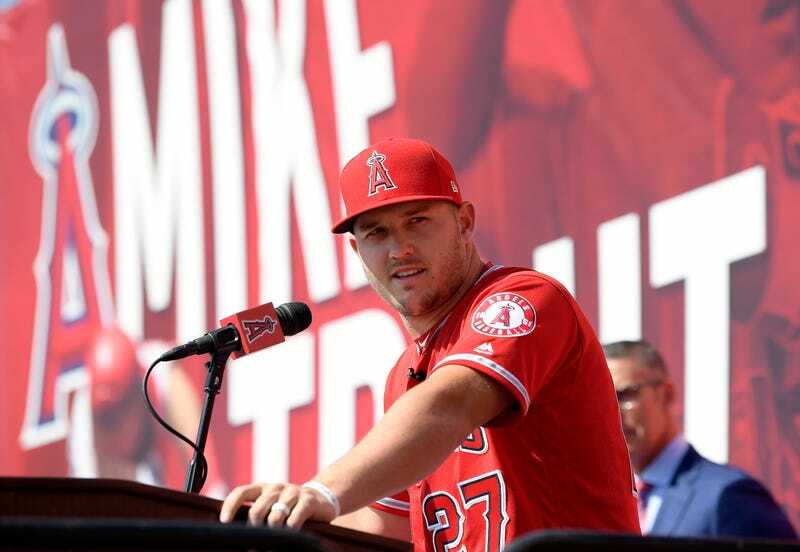 In a span of a few months, Trout was declared by the game’s commissioner, Glowerin’ Rob Manfred, to be a considerable part of the reason baseball was dying because he wasn’t selling enough shmata or dating enough starlets or engineering enough trades. Then he was paid Stephen Curry money to stay just like he is as a Los Angeles Angel, one of the game’s most persistently anonymous teams. Then the civil servants of Nerdvania churned out story after story saying that based on his baseball performance, he was still underpaid for all the things he does do instead of the marketing and social whoring some of us think he should do. I guess that’s what failing upward is like in the 2020s. So this is Baseball, The Place Where What We Think We Love And What We Think We Hate Collide. Where the born-old and dying-young philosophies battle it out by yelling past each other rather than drinking with each other. And I’m here to tell you that nearly everything seems more reasonable when you’ve had a snootful. But in its own weird way, it’s more American than ever. People who don’t like the game dismiss it in the modern style (“Nobody likes it, and by nobody, I mean me, so because it offends me it should die so I can water its grave because only I get to define fun”) while people who like the game offer the traditional gainsaying rebuttal (“You know nothing, because this is the soul of everything that we hold dear and your failure to understand this makes you a certifiable moron who we must pitilessly shame so we can water YOUR grave”). Why, it makes a person proud to be from anywhere else on earth. At least it would if you don’t stand back and see that while the game on the field has its issues (and whether they change or not will have no appreciable effect, good or bad, because nothing does any more), as a social and cultural force it reflects us in our present state brilliantly. Baseball as a sport is indubitably slower and less overtly athletic than basketball or to a lesser extent football, which means that baseball as an idea is often condemned for being “what Gramps did a million years ago.” And weirdly, baseball is agreeing with that. Demographics being the new hilltop upon which so many ideas go to die, the people who present baseball to us are frantically trying to figure out how close it can come to other sports while still being itself. I declare this to be a hilarious failure in advance for the same reason that golf isn’t boxing and horse racing isn’t pole vaulting, but that doesn’t alter the desire to try. The same is true of this country as a whole; we have no idea who the hell we are any more because the future is too scary to contemplate and rather than grapple with it together as though we all have skin in the game, we’re fighting over what the past was. This makes for fun tavern conversation, as long as your idea of fun includes getting brained with a beer stein 40 seconds in. And just as we don’t know who we are, neither does baseball. America! Mike Trout does, though. He’s a guy who knows what he’s good at, what he isn’t good at, and makes a consistent choice to be Option 1 and not Option 2. In that sense, maybe the more apt comparison is not to Curry but to Kawhi Leonard, or closer still, to Connor McDavid. And what baseball seems to say it wants, while not wanting it at all, is the next LeBron, or closer still, Rob Gronkowski. But as its 144th season begins, baseball remains stubbornly what it is while not sure of how to get to where it wants to be or whether that will be worth having upon arrival. Unlike the NFL and NBA, which load its schedules with marquee games, baseball does 162-times-15 the way it always has—every day, like a metronome. Trout opens his new season in Oakland against the decidedly un-rivalish Athletics, and that will be a hot story once and once only. After all, the one thing money doesn’t have is a personality. If truth were to be told, the most interesting thing to happen all off-season was the San Francisco Giants dynamiting the top of their organizational chart, from CEO Larry Baer (suspended after a domestic violence incident caught on video and permanently replaced as the operational head of the franchise in what can only be described as a silent coup in which the big winner seems to be a guy named Rob Dean) through the baseball operations department (now headed by Farhan Zaidi after years of Brian Sabean), and the last duck in the window is manager Bruce Bochy, who is shoving off at year’s end. And that’s baseball, with Mike Trout as its face. You could choose a much louder and more cartoony front man, but you could also choose a lot worse, and until baseball decides what it wants to be instead of what it is, he’ll do just fine. Watch if you want, don’t if you don’t. Why be aggravated if you don’t have to be? Ray Ratto was born old and died young. Now he just pours another drink and waits for the meteor like everybody else. How Much Longer Will Baseball Stadiums Be For Baseball Fans? Is This The End For Joe Thornton And The Sharks As We Know Them?